Check Out All of our Specialty Facials! Take advantage of these special discounts! Feel The Rejuvenating Benefits of Our Specialty Massage! Are You Ready for Total Body Relaxation? 3 Reason to Choose Us for your salon and spa day in Las Vegas, NV! Indulge in full-body pampering when you visit Dolphin Court Salon & Day Spa. If you're looking for a day spa with a reputation for pampering, you'll be glad you found us. You can feel free to relax, unwind and rejuvenate, so make an appointment today with one of our licensed practitioners who truly care about your comfort. Our top priority is to give you the best massages, facials, body treatments and hair services in Las Vegas, NV. You'll never want to leave our calm and peaceful atmosphere. Both men and women love the spacious treatment rooms and quiet, relaxing lounge space. 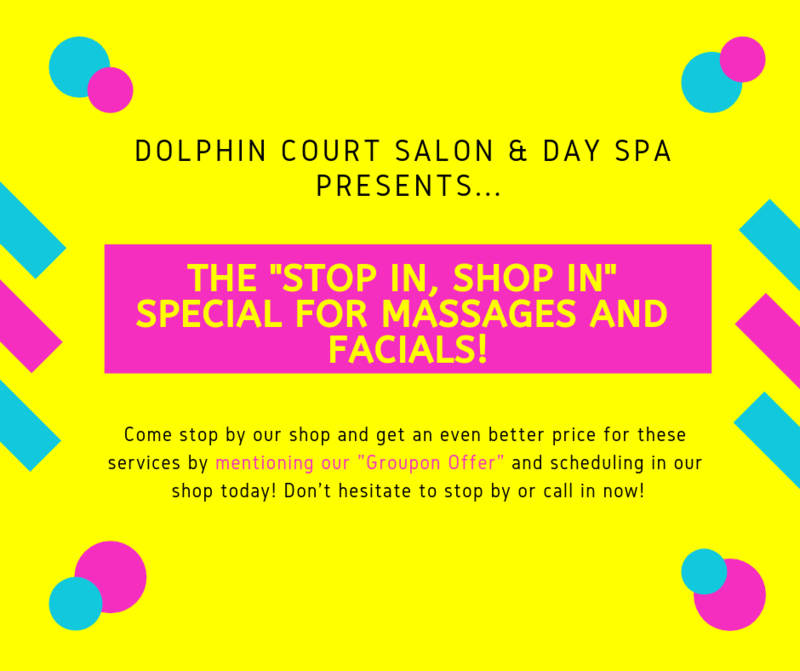 Dolphin Court Salon & Day Spa offers much more than your average spa. Come to us when you want to relax from head to toe. Relax your muscles with a deep tissue massage, and enhance your image with a fresh cut and color. Call 702-946-6000 today to make an appointment with one of our talented consultants. We offer new promotions and specials each month, so don't miss out on our frequent deals and discounts. Are you looking for a gift for the friend who has everything? A gift certificate from Dolphin Court Salon & Spa is the perfect choice. You can give the gift of relaxation any time of the year. Our gift certificates never expire and can be used for any of our services. Call us or stop by today! We're open seven days a week for your convenience. Copyright © 2019 Dolphin Court Salon & Day Spa, all rights reserved.